The parliament has amended the 2011 national university law authorizing the president to appoint nine members to the university’s 13-member governing council. The government-sponsored amendment bill was passed with 38 votes in favour and 16 against at today’s sitting of the People’s Majlis. Once the amendments are ratified, the president will appoint the chancellor, vice chancellor and deputy vice chancellors in addition to five members from outside the university to the council. The main opposition Maldivian Democratic Party (MDP) had warned that the changes will compromise the university’s independence and politicise the institution. Politicising the university would pave the way for hiring and dismissing officials for political reasons as well as the “misuse of the university’s students, employees, and resources to achieve political purposes,” the party said earlier this week. The Maldives National University (MNU) has on Thursday started accepting admissions for over 200 courses which are due to commence in the second semester of this year. According to MNU Deputy Chancellor Ali Shareef, the university will be accepting 6,220 new students into the said courses. Of these, 2,630 slots are reserved for students studying in capital city Malé. “The courses we are starting in the second semester includes courses at certificate level to masters level. A brand new course that we are introducing this year is secondary level teacher training in Dhivehi language at the Fuvahmulah and Villin’gili University outlet research centres,” he stated at a press conference held on Thursday. Shareef revealed that over 50 percent of the courses will be conducted in campuses other than the main one located in the capital. The deadline for application is the end of May. Students of the National University protested on the streets of Male’ on Wednesday over the construction of a wall in the university premises. Newspaper Haveeru reported that students and faculty members objected when digging for construction of the wall began on the university grounds. The wall was to be built on part of the plot separating the university from the adjacent Jamalludheen School. The National University’s central administration and some faculties are located at the old premises of Jamalludheen School. The government however gave 9,000 square feet from the old Jamalludheen plot to the school, which was facing constraints due to lack of space. The plot awarded to the public school was reportedly registered at the City Council last year. Meanwhile, over a hundred students began demonstrating in front of the faculty of education in the late afternoon on Wednesday, calling on the government to not give over part of the university plot. The students then marched over to protest in front of City Hall before making their way to Velaanage, which houses most government offices. When the students attempted to march to Republic Square, officers of the Maldives National Defence Force (MNDF) in front of the coast guard building blocked their path. The protest ended around 6pm. 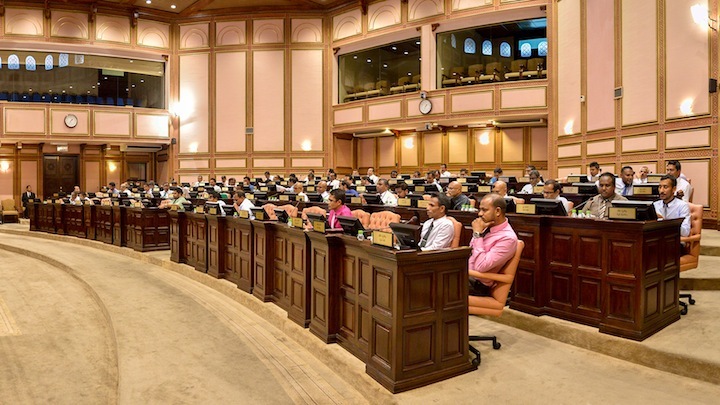 A National University bill was yesterday passed in the Majlis requiring the religious-focused Kulliyah to be run under a separate administration, providing opposition politicians a victory against the government, Miadhu has reported. The government had argued that running the Kulliyah under a single administration within the university would allow it to reduce costs of a service that had a much smaller number of students, according to the report. However, MPs said to be opposed to a single university administration that included the Kulliyah claimed that their victory would allow for improved standards and courses in higher education. “Teaching the Islamic cultivation does not mean it is only teaching the Arabic language. It is to teach in set methodology. It is to cultivate from childhood itself. This is to make them responsible citizens of society,” Faresmathoda MP Ibrahim Muttalib was quoted as saying by Miadhu.